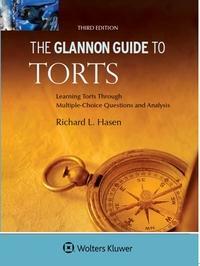 The Glannon Guide to Torts: Learning Torts Through Multiple-Choice Questions and Analysis, Third Edition is a powerful combination of well-written explanations, multiple-choice questions, analyses, and exam-taking tips. The text prepares you to take any type of exam that might be offered in a torts course. Honing your understanding of concepts and your ability to apply the rules, Richard L. Hasen presents a thoughtful review of course content—and, in the process, shows you how to effectively analyze and answer exam questions.